Here is a picture of all the soap I have curing right now. I am running out of flat surfaces in my apartment!!! Happy Halloween everyone! As I write this post I am enjoying a cup of tea and my new favorite vice, Crumbs cupcakes. They are to die for...they are huge and the frosting (my favorite part) is so delicious. I know I shouldn't be eating a cupcake at 10:30 in the morning but I couldn't resist! So last night Mike and I worked on soap stuff all night! Poor Mike, I think he was ready to kill me! We took tons of photos, made labels, made a batch of soap, cut another batch of soap that I had made the night before. I included some pics that we took last night. Now I am going to be busy all day posting to Etsy. Amidst all the soap hoopla, I got my sticker maker in the mail yesterday! All I can say is WOW! That thing is awesome, it works so much better than I thought it would! I am impressed. I have a ton of new bath products that I have been waiting to post to my shop because they needed labels. Now I need to work on designing them! I made a soap with my new fragrance oil, Berry Wine. It smells amazing, just like a glass of red wine. I can't wait to get it posted to Etsy. Have a great day everyone! Updated: Here are some of the pictures of my new soaps. Sometimes I spend more time trying to come up with a title for my post than I do writing the thing! Well "Random Babbling" was as creative as I could get for a Monday afternoon! A few hours ago I was delighted to find a convo waiting for me on Etsy from Love and Squalor, one of my favorite shops on Etsy. They have featured my Awareness Soap in their blog today! It totally made my day! This weekend I played around with a bunch of my new supplies. I made soap with the Sandalwood Vanilla and the Cherry Almond...both turned out great, I am really happy with the outcome. The Sandalwood Vanilla is such a great scent, it's becoming my new favorite, I can't wait to try one....this is always the worst part when you are waiting for them to cure! Mike and I usually always break down and use one before we should, nothing wrong with doing so really, they just won't last as long in the shower! I was able to experiment with some new products over the weekend, I made a baby bath tea. I have a baby soap and wanted to create something to go along with the soap. I sampled one and it was incredible. 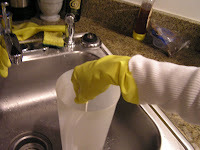 I used colloidal oatmeal in it and you could feel the difference right away, it was so moisturizing. My legs get really dry and with winter creeping up I am already starting to feel the pain of the cold and this bath tea made all the difference. I can't wait to get this posted to Etsy. Now I just have to come up with some creative packaging. Ok, that's enough random babbling for today....Happy Monday! Just wanted to share some pics from the Dog Halloween Parade in Thompkins Square Park. We went this afternoon after brunch. We took a ton of pics but I wanted to share the best ones. Enjoy! I just bought the Xyron 510 Sticker Maker! I am so excited! I have been wanting this for a while now along with the Print Gocco which is way too expensive for me to buy right now! Anyway, I found a great deal on it at the website so I decided to buy it. I am starting to make things that require sticky labels and I am hoping I can make them myself with this machine...we'll see how it goes! The machine laminates and makes magnets too. I'm so excited for it to get here! I also received my supply order today which has a ton of great new fragrance oils in it. Among the many that I ordered, the two that stand out are the Cherry Almond and Sandalwood Vanilla...they are both awesome!! The Sandalwood Vanilla is supposed to be a more masculine smell but I don't think so at all....I love it! I can't wait to start working with these. I am going to be so busy getting product ready for the show next month, I think I am going to be making soap every night! I just found out my mom is coming into town next weekend, I am so excited!! She hasn't been to the city since last November so I can't wait for her to come up. I have a ton of new places in the city to show her and I haven't seen her since June so I am definitely looking forward to her visit. We have massage appointments at Bliss and we are going to go shopping in SOHO and have tea at the Mandarin Oriental and the leaves are still changing in Central Park so she will be able to see that (something she doesn't normally get to see living in Florida!). It's going to be such a blast! Mike will be in Florida for a wedding so it will be quality time for me and my mom. This weekend should be pretty low key. Just going to watch the Gator game tomorrow and relax. I was sick this week and still feeling a little worn out from that so I plan on taking it easy and making soap, lots and lots of soap! Have a great weekend everyone. Yesterday morning while I was waiting for my tea to steep and getting really annoyed at my new kitchen timer which has decided to stop working I was reading through my blogroll and stumbled upon this really cool gift guide: The Modish Holiday Gift Guide. It's this really cool indie shopping guide, definitely something I will be checking out while doing my holiday shopping this season! 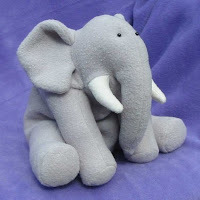 So Saturday night while I was suffering from an odd case of insomnia I was fumbling around Etsy and bought the cutest pattern for a stuffed elephant. It's an awesome deal, it was $7.99 and she sends you a pdf of the pattern right away. I can't wait to start making it! 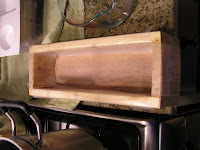 In addition to finding that super cute pattern I also was able to make a new product...a Lavender Salt Soak. It turned out really well...I used a couple different types of salts, lavender buds, goat milk, and essential oil. Now all I need to do is get a label made for it and I can post it to Etsy. I also finished the packaging for the baby soap I made. I am so happy with the way it turned out, it's just as I imagined. That soap is ready to go so I will probably be getting photos of it this week and posting to my shop soon. That's all for now...happy Monday everyone! 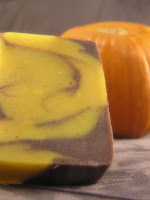 I just finished making the pumpkin soap...finally!! I've had that darn pumpkin sitting on my fridge for over a week! I can't wait to see how it comes out of the molds! It looked so pretty when I poured it, the pumpkin turned it a beautiful orange. I have included some pics of the process....unfortunately towards the end I got so involved in the process I forgot to keep taking pictures so I only got photos of the prep. This was my first attempt at swirling too, I have been doing a lot of reading on it and everyone says it's really tricky to get the first time you do it so hopefully it wil turn out (fingers crossed!). 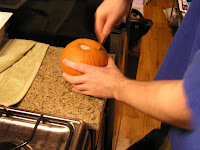 We pulled the pumpkin seeds out and roasted them, they were delicious! Well I'm off to finish watching Law and Order and to start working on a lavender salt soak....good night! P.S. Pictures will have to be posted later, blogger keeps giving me an error message when I attempt to enter photos to this post!! So in my effort to build my product line I attempted to make some solid perfume. I made three different scents. Two of which I made with essential oils. I was going for a sort of aromatherapy type product. I made one with lavender essential oil for relaxation and the other with peppermint essential oil for an energizing blend. After trying them out I realized quickly that they wouldn't work as solid perfume because essential oils aren't designed like fragrance oils and the smell doesn't really stick to your skin. I reviewed the recipe and realized that the recipe is almost identical to a lip balm recipe so I used the lavender one last night on my lips and I love it!!! The recipe had shea butter in it so it's super moisturizing and the lavender smells so great. I would have never thought of lavender in a lip balm but I love it!! Now I just need to get them posted to Etsy. This weekend was so nice and relaxing. It's finally getting cold here so I got to wear my boots for the first time! I love winter clothes, all the comfy sweaters and turtlenecks. This weekend we are going to our storage unit to pull all our winter stuff out and put our summer stuff away (sigh!). I can't believe summer is over. I am really looking forward to the winter this year, I love the holiday season and the city looks so beautiful when it's all decorated for Christmas! I also can't wait for all the Christmas craft fairs and bazaars, there are three pretty good ones that I went to last year and I am excited to check them out and see what kind of goodies I can find! Well I didn't get much soap making done this weekend...ok make that any soap making! I was so busy with my real job this week that once Friday arrived all I wanted to do was relax so still no pumpkin soap...I am going to try and work on it tonight! By the time I get it made Fall will be over! Well that's all for now, I must get back to the job that pays the bills! I have been so busy this week I haven't had any time to blog until today! What a week, work (the real job that pays the bills!) has been sooo busy and I have hardly had time to work on anything Etsy related :( I got my new book in the mail a few days ago, Last Minute Patchwork and Quilted Gifts. It is so great...I can't wait to start some projects in it. I think I am going to make all my Christmas gifts from that book! A girl in our office got married last weekend so we took her to the Mandarin Oriental yesterday for afternoon tea. It was so amazing. If you are ever in New York you have to go, it is such a great experience. Anytime I have out of town visitors I always bring them to the Mandarin for tea. The lounge is on the 35th Floor of the hotel and there is a totally unobstructed view of Central Park. It's beautiful! I had a great weekend but did not get a chance to make any soap or take any pictures of my new soaps :( which means nothing got posted to Etsy. I will try to get that done tonight but I have a custom order to finish up and my supplies just got here so I am going to be busy, plus I am coming down with a cold so my energy is zapped! This weekend we had a great dinner at The Palm. We walked to the Doughnut Plant on Saturday to get some yummy doughnuts for breakfast. Mike got an Italian Plum jelly doughnut and I had a bite, it was delicous. I don't know how that guy does it, but he is a doughnut genius!! We watched the LSU, Florida game and sadly Florida lost :( It was such a close game! 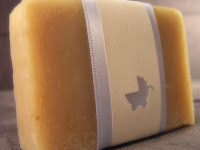 I am itching to start making soap since I didn't get a chance to make any this weekend. 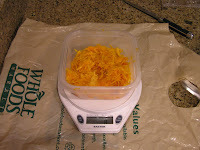 I have an idea for a pumpkin soap so I will need to go to the store to get some supplies. It should be interesting since I have never worked with something like this before and cold process can be so fussy! I will keep everyone posted on the process! I am sitting here enjoying a yummy cup of vanilla tea and wondering why in New York they insist on putting slivered almonds on top of cheese danishes. Cheese danishes are my favorite breakfast treat and for some reason every restaurant I order one from up here decides that slivered almonds should go on top of them....I don't get it! So the weekend is upon us, I am looking forward to it. Tonight Mike and I are dining for free at The Palm as part of a mystery shopper assignment I received. This will be the third time we have gotten to eat at The Palm for free and we are looking forward to a nice FREE steak dinner tonight. :) Looking forward to a relaxing weekend, not too much planned...exploring the city, making soap, football games, brunch...ok maybe a lot planned ;) I made a bunch of soap this week so I am anxious to get pictures taken and start posting to Etsy on Monday. I made a baby soap a few nights ago...I took quite a few pictures of the process to post to this blog but haven't gotten a chance too. It will be ready in 4 weeks so I am pretty excited about that. I also have a craft show to prepare for. My best friend Melissa was kind enough to offer to sell some of my wares at the show she is doing in Florida the day after Thanksgiving so I am very grateful to her and will be very busy making lots of goodies to send to her before Nov. 23rd. Well that's all for now...will be sure to post again soon. Happy Friday and have a great weekend everyone! So yesterday I ordered a new book Last Minute Patchwork + Quilted Gifts by Joelle Hoverson. I saw the book over the weekend when I was shopping at Purl Soho and wanted to buy it on the spot but knew I could find a better deal at Amazon! Turns out the author of the book, Joelle Hoverson, is the owner of Purl Soho! So now I am really excited to get the book...Joelle has been featured several times in Martha Stewart Living and Blueprint (she used to work for the magazine) and I think she is an amazingly talented crafter! I can't wait to get my hands on the book and start sewing...as much as I LOVE soap making, I think I love sewing even more! It's so therapeutic and I love the idea of taking fabric and a pattern and making it into something beautiful. Mike is going to shoot me if I bring home one more book though!! I already have a ton of books in the apartment plus a ton more in our storage unit! I'm obsessed with books! 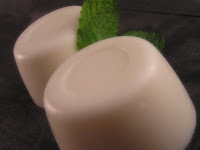 Last night I made a new soap with a fragrance oil I have used before, Coconut Lemongrass. It smells delicious and the bar came out really nice. I added goat milk powder to it for extra moisturizing properties. It's the perfect scent, so reminiscent of summertime and the beach! I am going to take photos of it tonight...let me rephrase that...I am going to ask Mike if he will take photos of it tonight ;) so I can post it on Etsy tomorrow. Today is Monday and I definitely have the Monday blues :( As I type this blog, I am sitting at work enjoying a cup of tea and eating cookies that a girl brought in from Japan (she just spent two weeks there). This weekend I got a massage at Bliss and then went to my favorite fabric store Purl Soho to look for fabric for curtains for the apartment and a new purse but I couldn't find anything...I always get so overwhelmed when I go there!! I could spend hours looking and the shop can't be more than 100 square feet!! I finally finished the breast cancer awareness soap and Mike and I took pictures of it last night. I posted the new soap to Etsy this morning. I am really happy with the way it came out, the smell is amazing...it's so refreshing and clean and smells just like a grapefruit. Last night I attempted to rebatch a cold process goat milk soap that I made which turned into a disaster...it is the first time I have ever rebatched and it did not turn out well at all. It smells great (rosemary peppermint) but it does not look pretty! I guess Mike and I will use them. Well I am off to the dentist...bye for now.